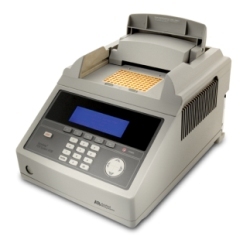 Applied Biosystems GeneAmp PCR System 9700 is specifically designed for reliable PCR. The GeneAmp® PCR System 9700 consists of a base module and one of many interchangeable sample block modules to provide you with the flexibility to meet your changing research needs. The versatile, easy-to-use 9700 PCR system delivers the proven performance and reliability of earlier generation Applied Biosystems 9600 and 2400 GeneAmp instruments, and is fully compatible with methods developed on these systems. But the 9700 system’s modular design gives a whole new level of versatility and ease-of-use.